Wow! 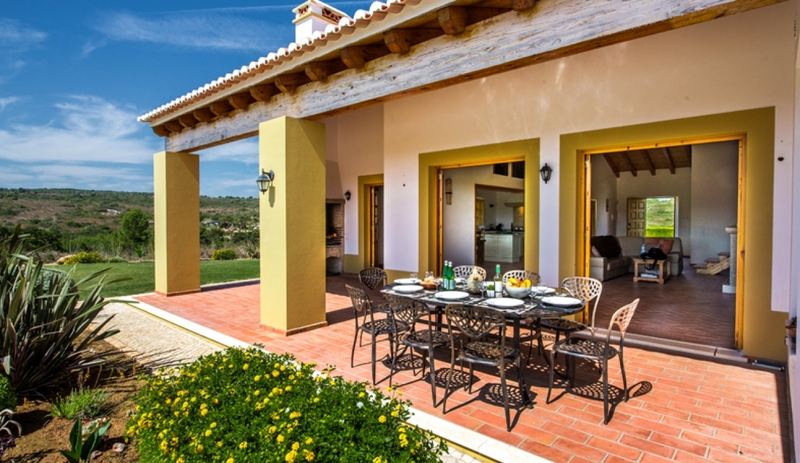 Coruja is a very spacious, open plan villa with loads of outdoor space and breathtaking views of the surrounding countryside - you won't want to leave! 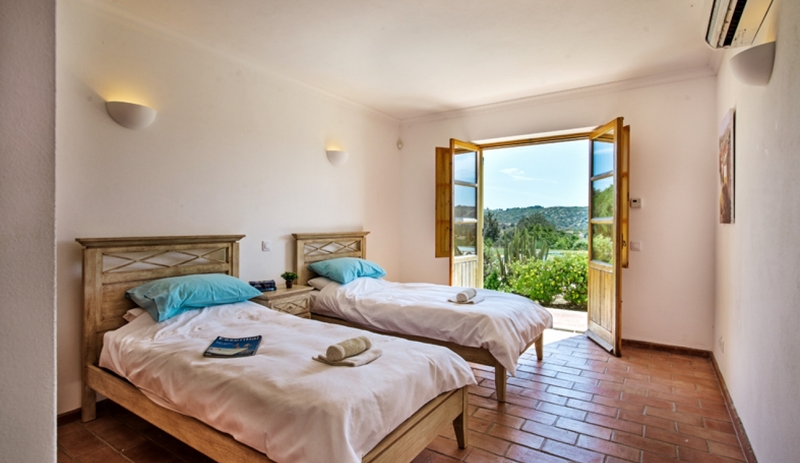 Optional extras: Extra Z-bed 75 EUR/week; travel cot / high chair 40 EUR/week each. Extra cleaning, chef, grocery shopping, child care, car hire, drinks delivery service (30 EUR for a 6 litre beer keg!) available on request subject to availability - please enquire for more details. Arrival and departure: Arrival from 3pm (please see 'extras' for late arrivals), departure by 10am please. 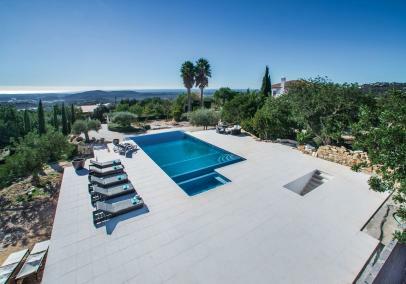 Villa da Coruja is already proving popular and we can see why! 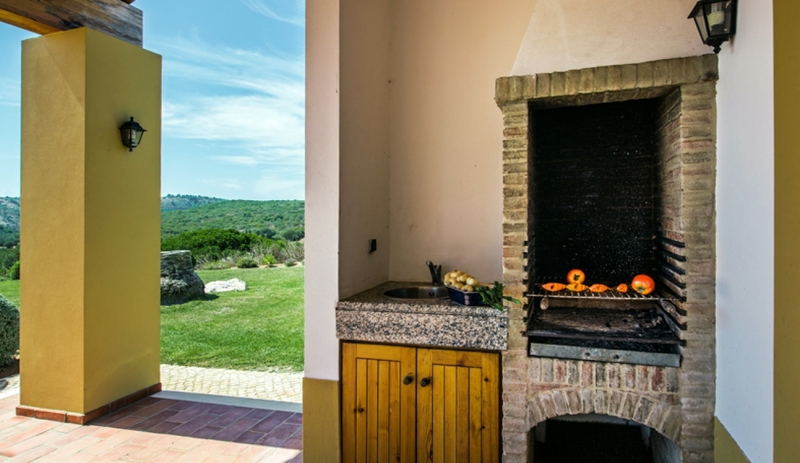 The villa is set in a really private plot but doesn't feel too isolated (you might spot the local shepherd with his herd of goats and sheep if you're lucky, but apart from that it's a really tranquil location!) There is just so much space, both inside and outdoors, making it a very practical and relaxing setting for a family holiday. A sympathetic mixture of modern open-plan design coupled with traditional features creates a very pleasant ambience for a family holiday. Extended family break or plenty of room for two families sharing. 5 bedrooms and 4 shower rooms and lots of space indoors and out - perfect for activities enjoyed together or for finding your own quiet spot for some down time. 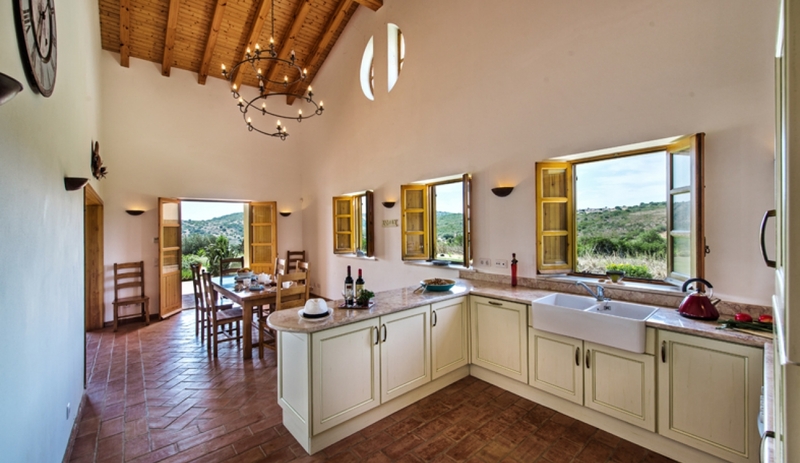 This villa has also proved popular as a location for yoga/massage retreats, please enquire for more details. Toddlers - no pool protection & pools are unheated. Two are very shallow so good for paddling. Plenty of space to play. Baby cot and high chair available at surcharge. 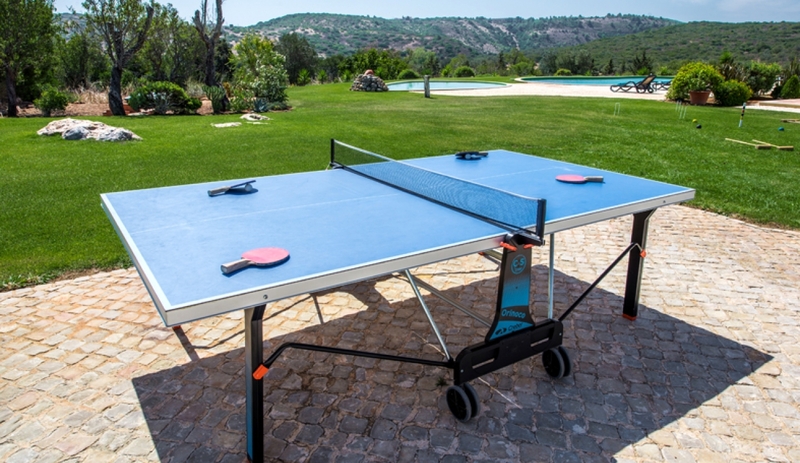 Teenagers - WiFi, loads of space to explore and run around, table tennis is a nice touch too. 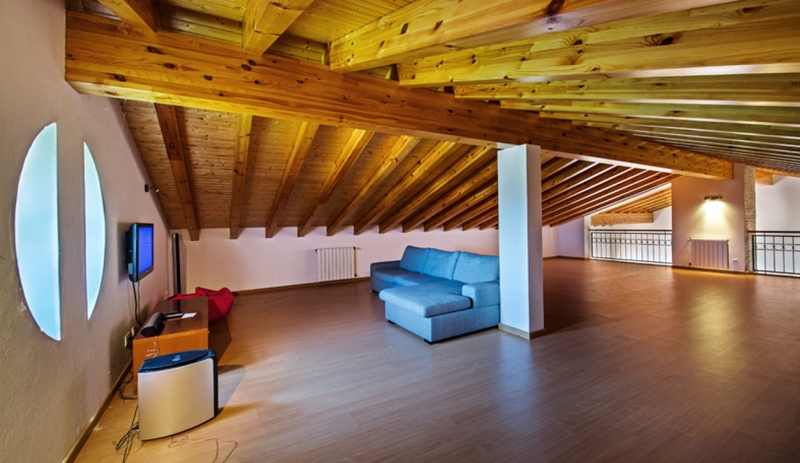 Reduced mobility - The accommodation is all on ground floor level, apart from the mezzanine. 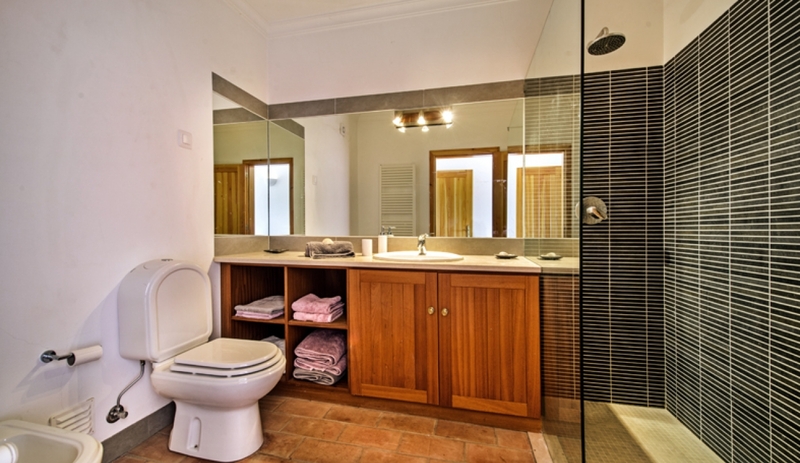 Very open-plan layout, one shower room also has a bath with shower attachment. There's no pool protection in Portugal. Care should also be taken with young children around the open-tread mezzanine steps and the railings on the mezzanine level. Car is essential due to the secluded location. Still relatively unknown and a world away from the packed beaches of the eastern Algarve, these are charmingly traditional little cliffside villages. You can be sure to find beautiful beaches enclosed by cliffs on either side, and a great selection of authentic beach bars and restaurants. 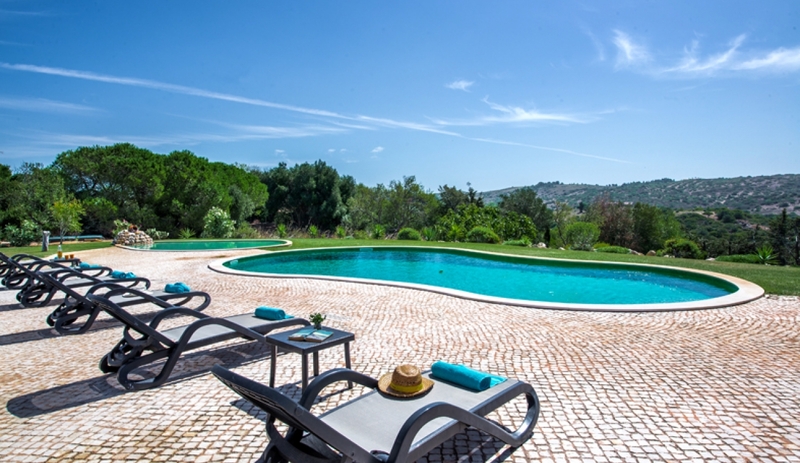 Perfect for a relatively quiet and laidback taste of the Algarve, but just a short drive away from Lagos and more well known beaches and resorts if you decide to explore a little further afield. 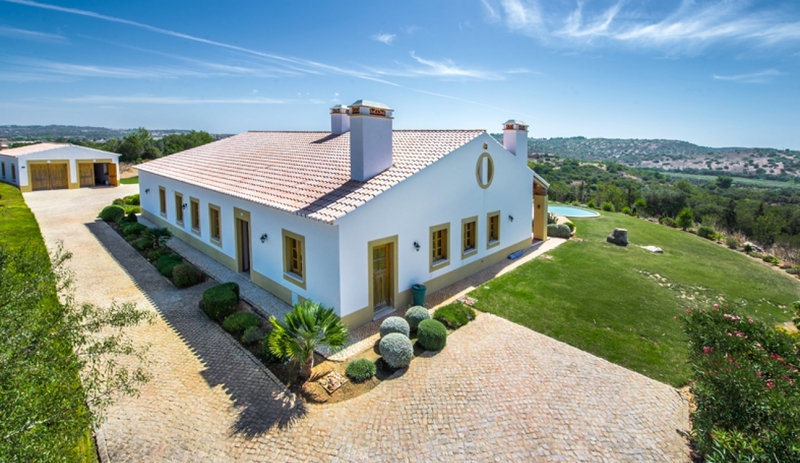 Authentic Portuguese quinta (farmhouse) with traditional touches, a very spacious interior and 3 acres of sperb grounds. 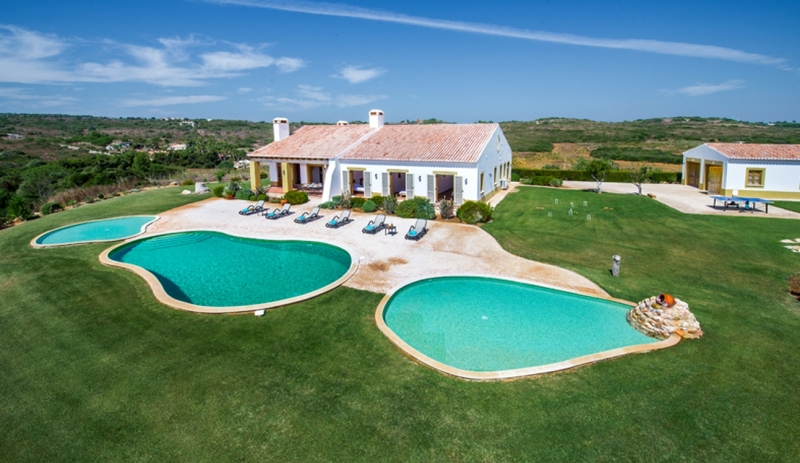 Villa da Coruja is a beautiful property that's full of character and set in an idyllic location. 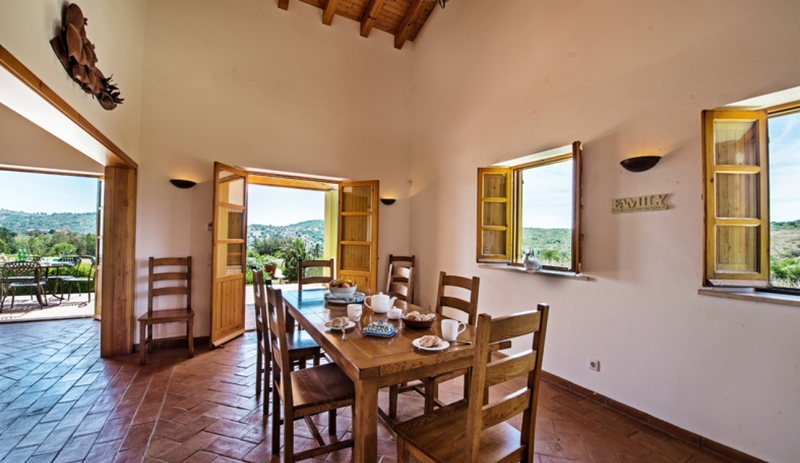 Traditional touches include Santa Catarina terracotta-tiled floors and wooden beams. With spectacular views of the countryside all around and ample grounds, there's plenty of space to relax and for little ones to play. The majority of the accommodation is on the ground floor, and with plenty of windows and patio doors, it feels very light and airy inside. 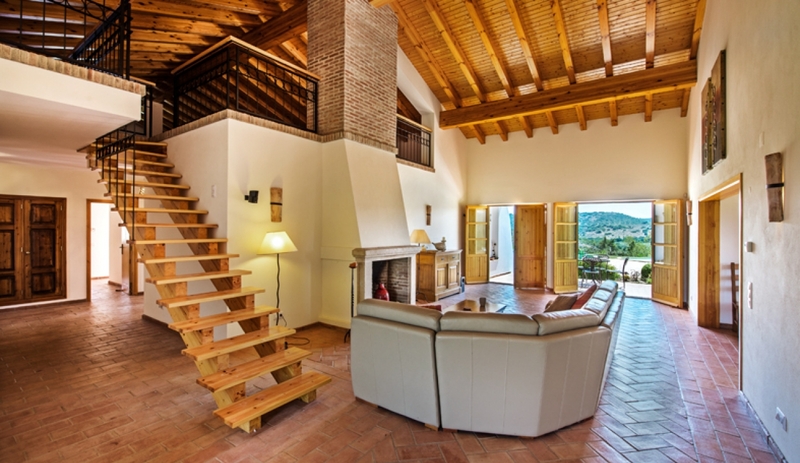 The rustic floor tiles and exposed wooden ceilings add a touch of the traditional. 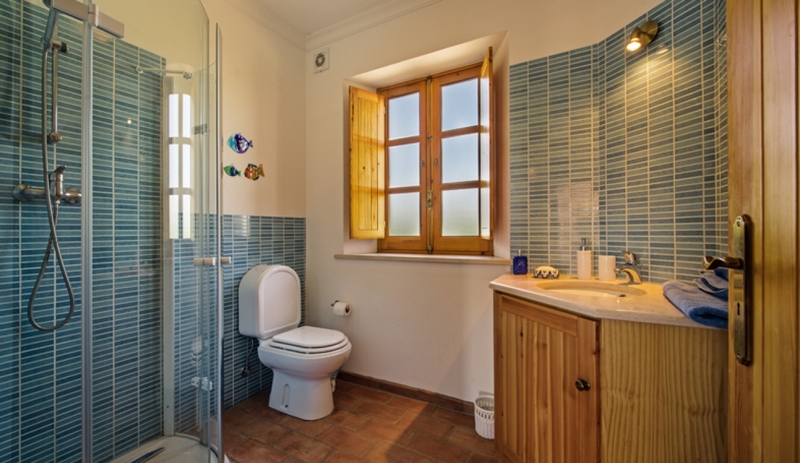 Coupled with wooden furniture and units, it's a mixture of clean, modern aesthetics and traditional architecture. 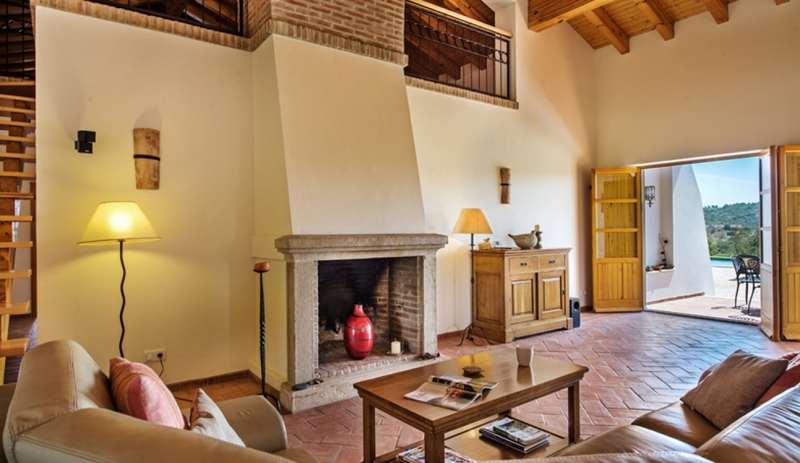 Enter the villa into the open-plan living area with decorational fireplace and comfy seating area. Open-tread stairs up to the very roomy mezzanine area, with TV, table football and a great spot for chilling out of the sun! The mezzanine has also been used for yoga classes as part of a retreat - a very useful and versatile space. Back downstairs, to the right of the living area is the open-plan kitchen and indoor dining area. 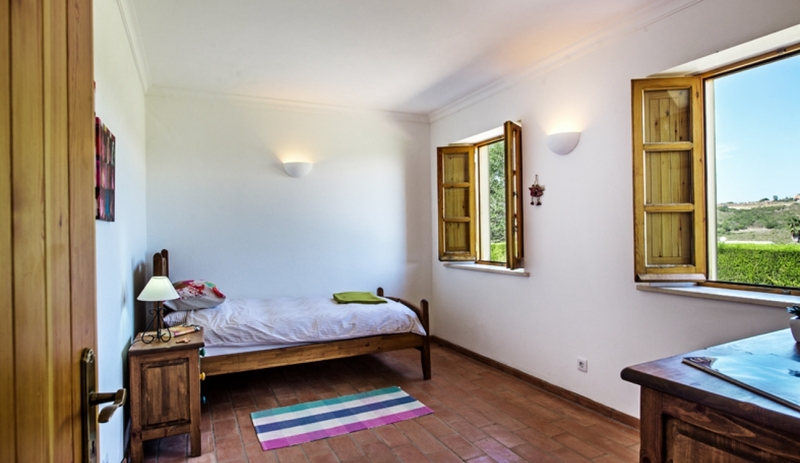 The tiled floor continues through to the bedrooms: there are 3 twin rooms and 2 doubles. 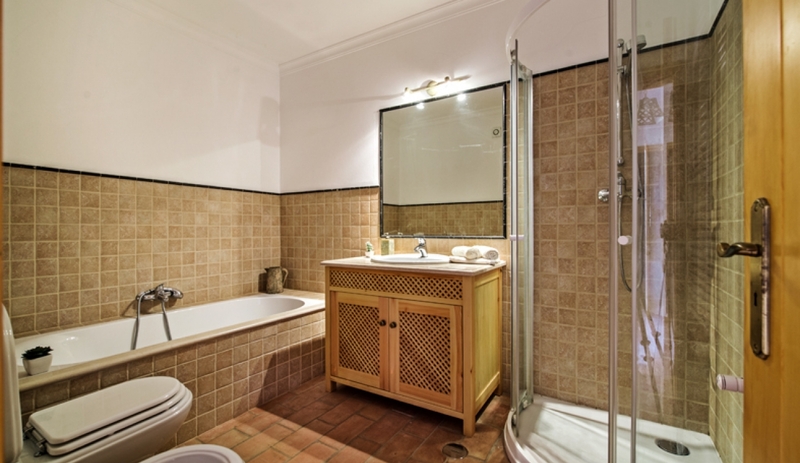 The two doubles each have their own ensuite shower room, whilst the other three twins share two separate shower rooms. 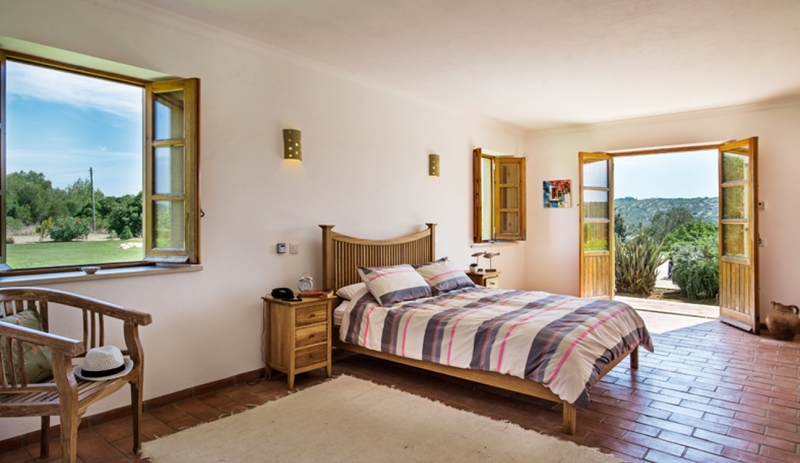 The bedrooms are light and airy, furnished in rustic wood and fairly minimalist in décor, giving them a clean and fresh feel. 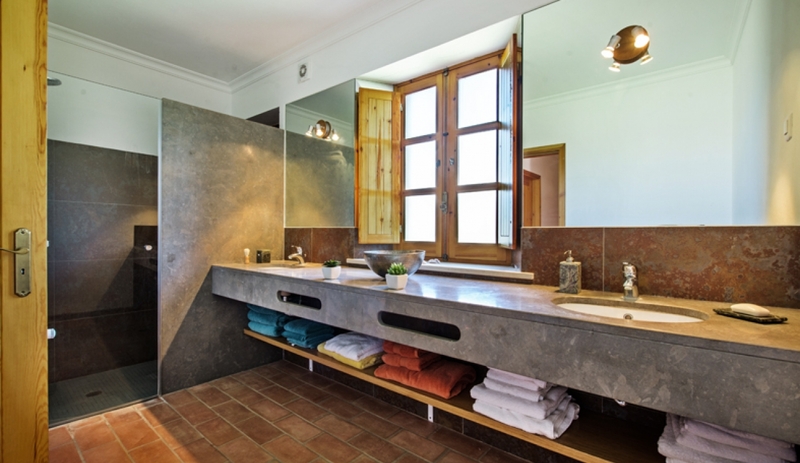 the shower rooms are all modern in design. 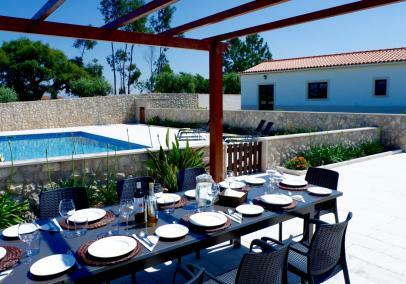 Spacious covered veranda with outdoor dining area: traditional Portuguese BBQ and sink area, outdoor dining table. The outdoor dining area looks onto the paved pool terrace with plenty of sun loungers for relaxing around the pool. 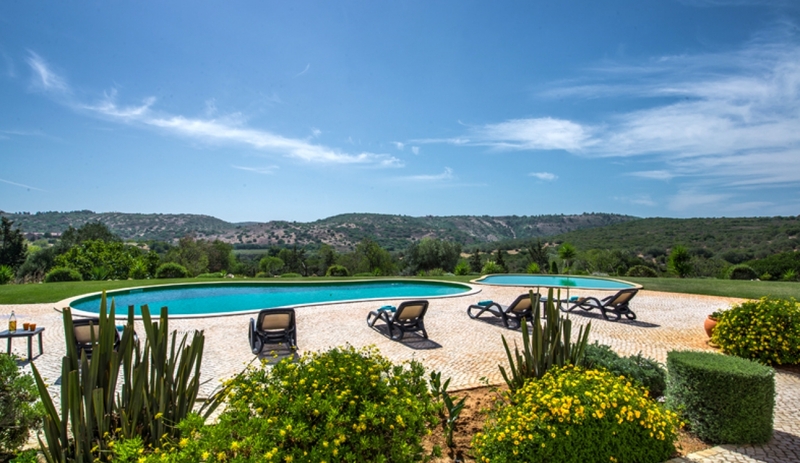 Three separate pools, two of which are shallow and perfect for children to splash around in. 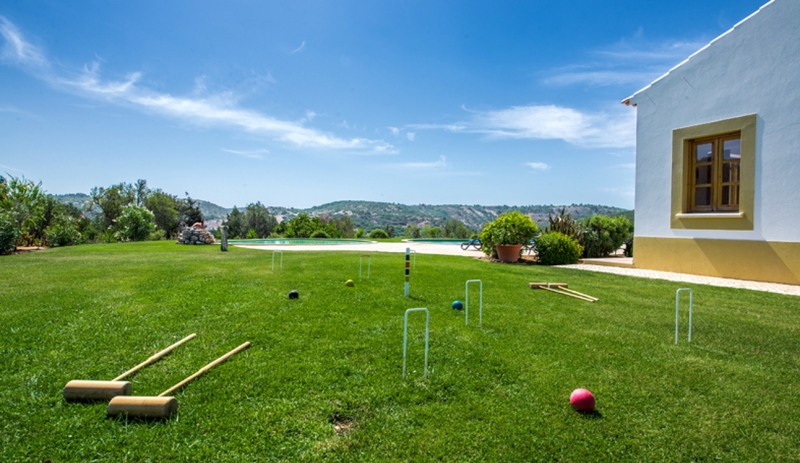 There is a large lawn area as well as landscaped gardens, with table tennis and a lawn croquet set for guests to use. 3 separate pools, 2 are very shallow. Unheated. 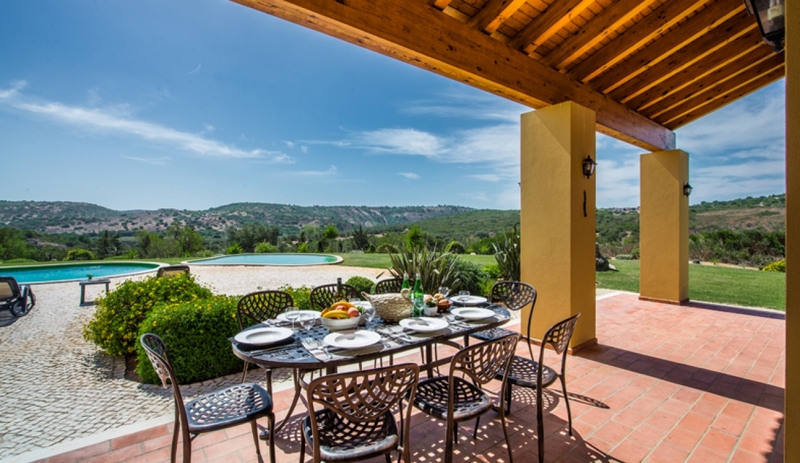 Set in an idyllic countryside location just north of Burgau, Villa da Coruja is peaceful and tranquil yet just a short drive to beaches and amenities. 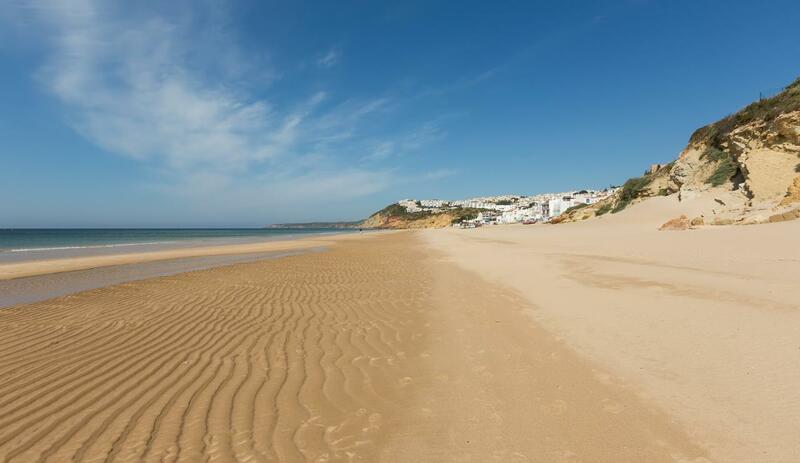 It's a five minute drive to the little town and beach at Burgau (or a 45 minute walk if you're feeling adventurous!) 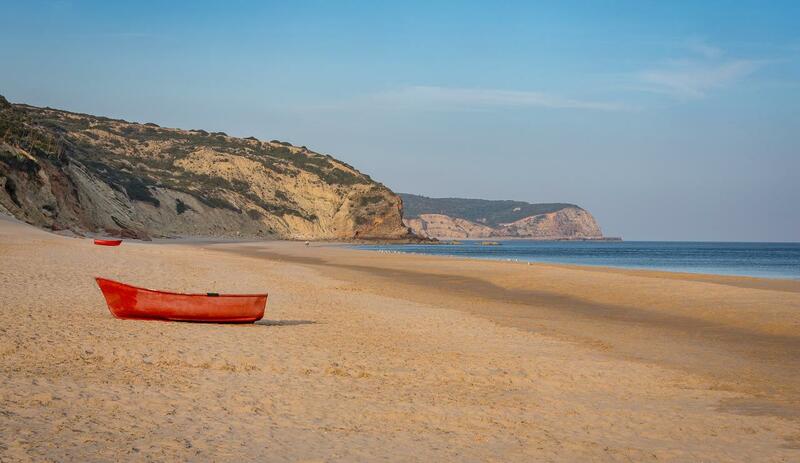 Lagos is just under 30 minutes away in the car or head the same distance west towards Sagres and the stunning Costa Vicentina Natural Park where towns are few and far between. 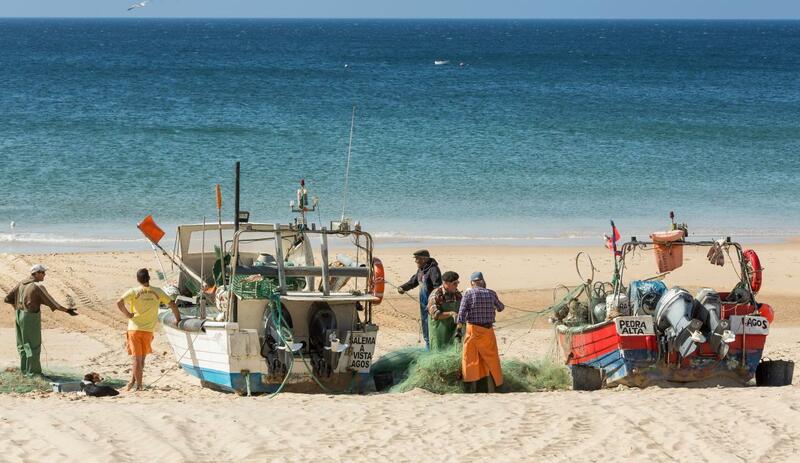 There are wonderful, secret beaches to explore and some beautiful coastal scenery too. 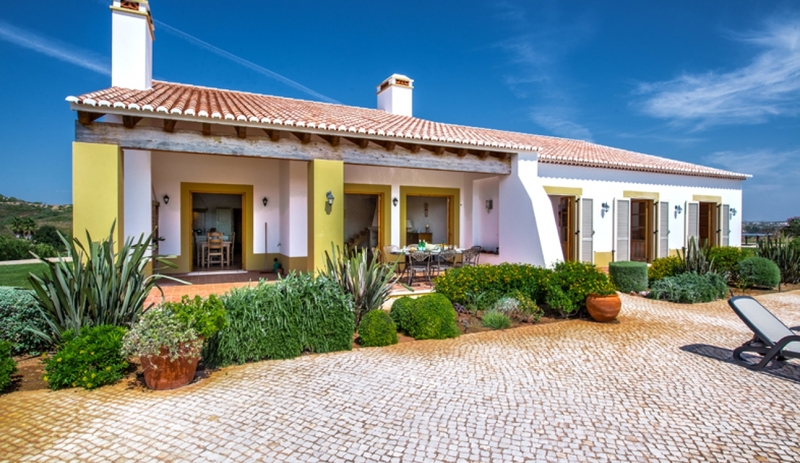 Villa da Coruja is in a great spot for exploring the variety of towns and beaches along this section of the Algarve coast. 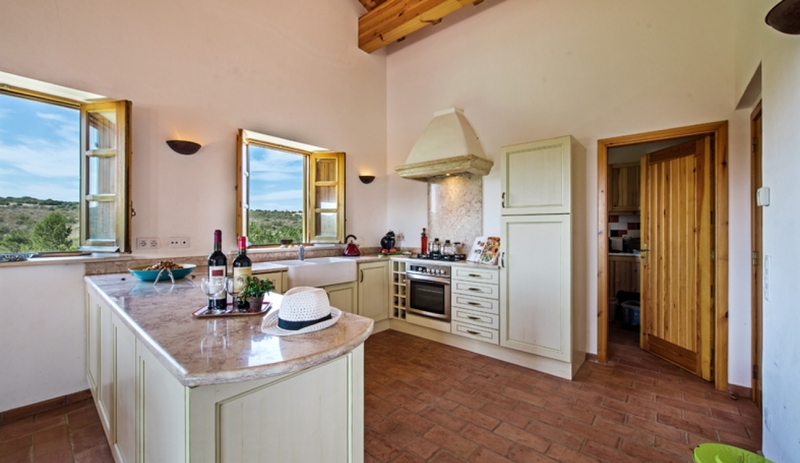 Service: Amazing property, helpful and friendly staff. Highly recommended.